With its cities routinely topping fastest-growing metro area lists, coastal South Carolina is undergoing a historic transformation. As the area's human population has grown, the area has also seen extensive land use changes along coastal rivers and marshes. 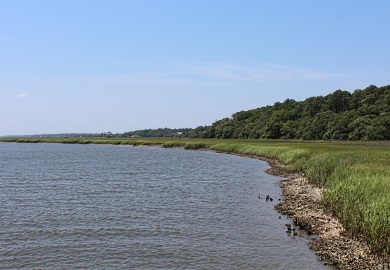 A recent study published in Estuarine, Coastal and Shelf Science takes a look at some of the ways in which that growth is affecting local waterways. Working over two years to study four coastal sites, a team of S.C. Department of Natural Resources (DNR), University of South Carolina (USC), and College of Charleston biologists found that the level of development surrounding a waterway significantly impacted its microbial community – and its vulnerability to algal blooms. "The big picture question of this study is, as land development increases, how might nutrient runoff associated with development affect algal community composition? Does it make the ecosystem more or less susceptible to algal blooms?" said principal investigator Dianne Greenfield, who holds a joint appointment with DNR and USC. "One of the suggestions of this work is that as development increases, the likelihood of algal blooms – including blooms that contain harmful species – is exacerbated." Phytoplankton are single-celled microscopic organisms that live in bodies of water and form the base of aquatic food webs. Usually, a balanced mix of several phytoplankton species are found in waterways. But sometimes, particularly in systems with high nutrient levels, certain phytoplankton species proliferate to very high levels. Some, called ‘harmful algal bloom' species, can even produce toxins that may threaten public and environmental health. A significant body of research has looked at the impacts of too much nitrogen, which can come from sources such as fertilizer or animal waste runoff, on water systems. But few studies have looked at the impacts of excess nitrogen on algal community composition across a range of land uses. That's what's unique about the present study, Greenfield said. Lead author Michelle Reed, a recent alumna of the Graduate Program in Marine Biology at College of Charleston, ran 32 different experiments across four distinct sites in coastal South Carolina. The research sites were each chosen to represent different levels of development, ranging from a forested tidal creek in the ACE Basin (least developed) to a stormwater detention pond in a residential/golf course area (most developed). A creek in a mixed forest/agricultural area and an urbanized tidal creek were also used for lower and higher-impacted land uses, respectively. Between 2011 and 2013, the team conducted experiments at each site by collecting water in bottles then spiking the bottles with different forms and combinations of nitrogen and phosphorous in order to simulate the effects of nutrient enrichment (i.e., fertilizers or other urban runoff). The researchers then kept the bottles at the site so that algae experienced their natural environmental conditions. After two days, the experimental bottles were transported to the laboratory, where the researchers looked at the nutrient chemistry and phytoplankton communities in each sample. The results were a portrait in miniature of what each waterway might look like after an influx of nitrogen or phosphorous, and the findings were clear: in the urbanized creek and detention pond locations, phytoplankton grew more rapidly and were more likely to harbor harmful algal bloom species. The phytoplankton communities from the less-developed sites (forested creek and agricultural area) were more resilient and less susceptible to blooms. "The response patterns of phytoplankton are really shaped by the way the land use differs," Greenfield said. Additionally, the team found that the type of nitrogen added mattered. Organic nitrogen, for instance, had a highly significant impact on algal growth. Greenfield hopes the findings from this and related studies could aid in that process of developing thresholds for nutrient levels in estuaries. "We hope that managers will use the information that we've provided and incorporate our research into their decision-making process," Greenfield said.